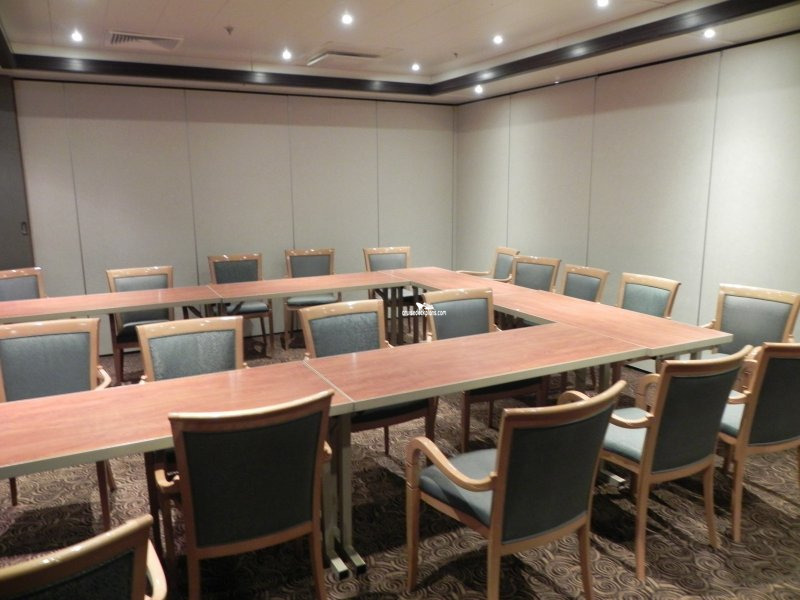 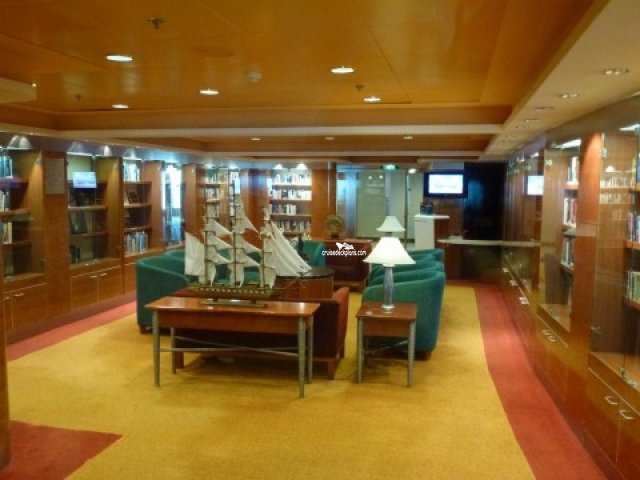 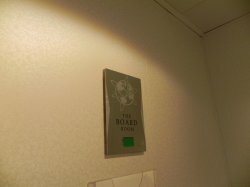 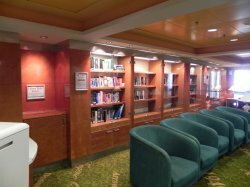 Seats up to 13 guests and has a well-stocked selection of books for guests to choose from along with a number of board games and also has daily Sudoku and crossword puzzles. 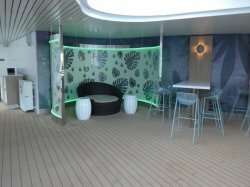 An outdoor bar seating 128 guests and open from 8.00am to close serving the latest cocktails to guests. 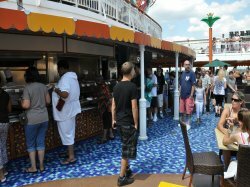 Serves snacks such as burgers, grilled chicken, hot dogs, fries and potato crisps along with sides such as potato and macaroni salad, coleslaw and fresh fruit. It opens from 8am to 10.30am for breakfast snacks and 11.30am to 5pm (subject to weather conditions). 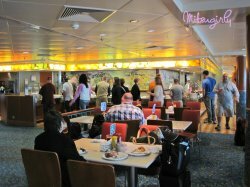 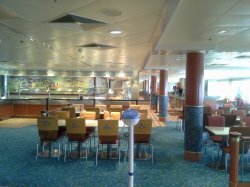 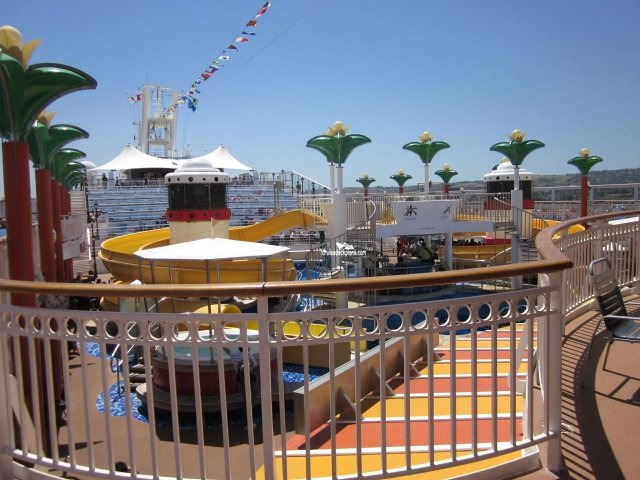 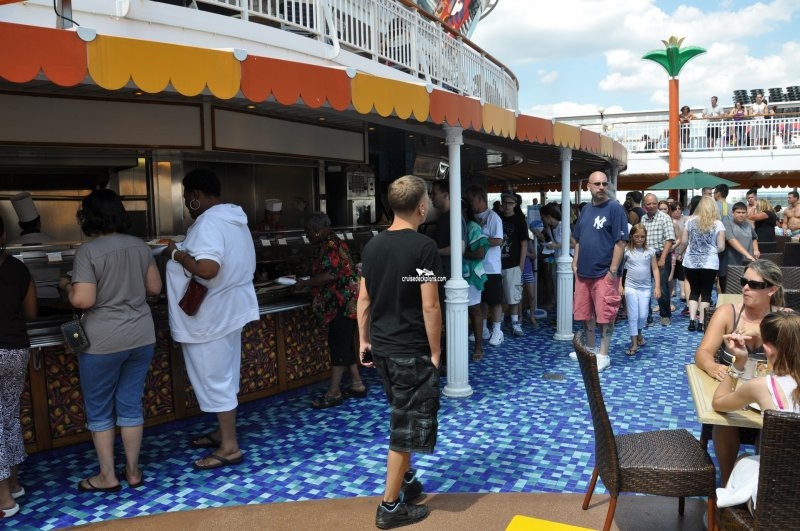 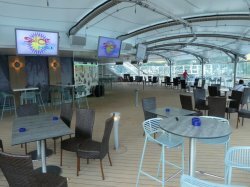 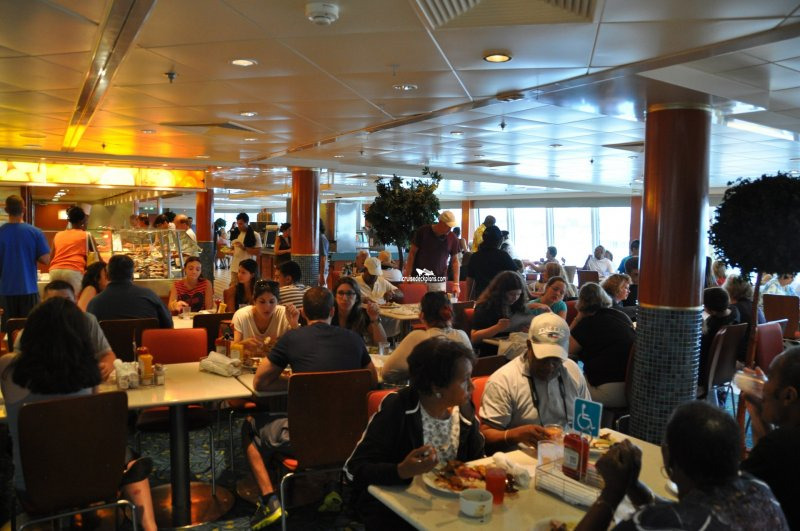 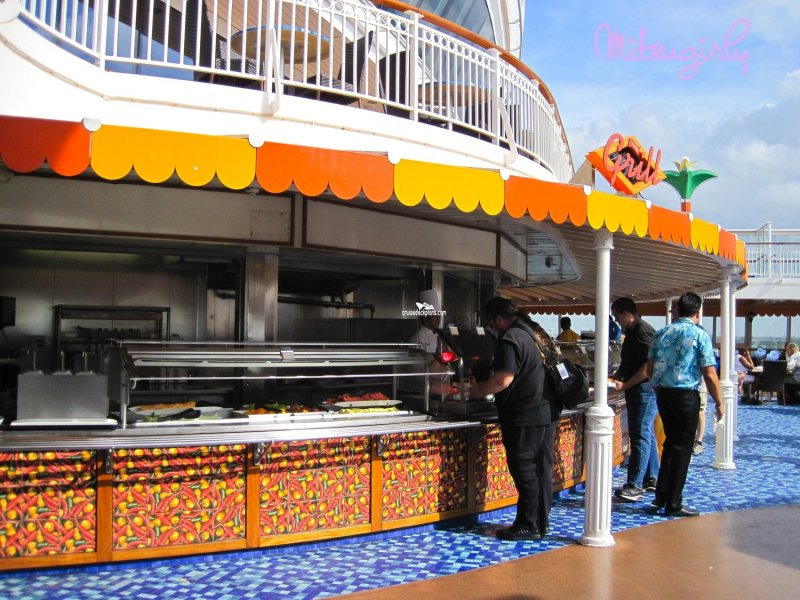 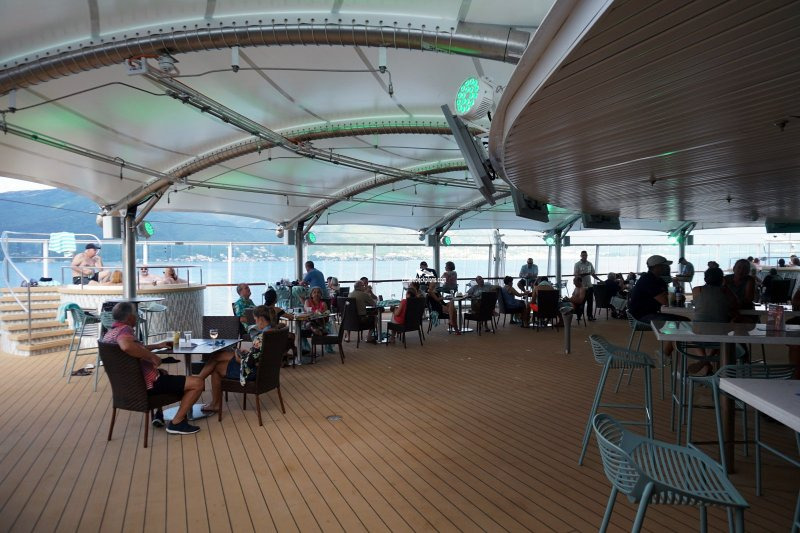 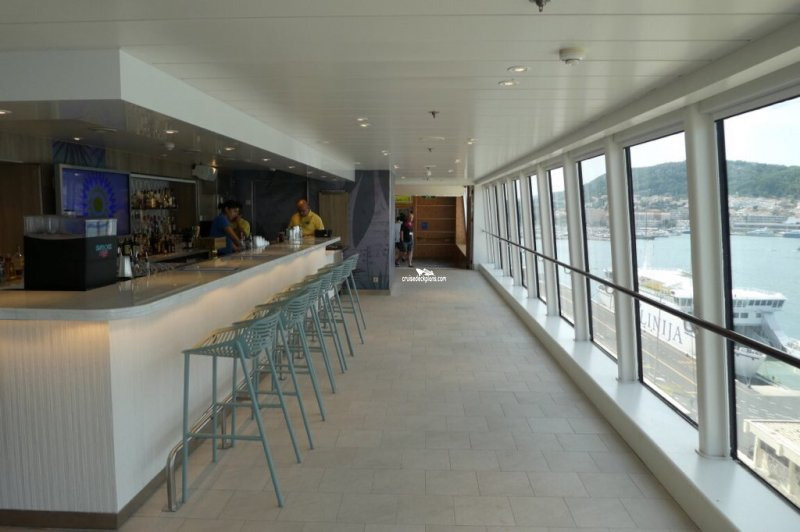 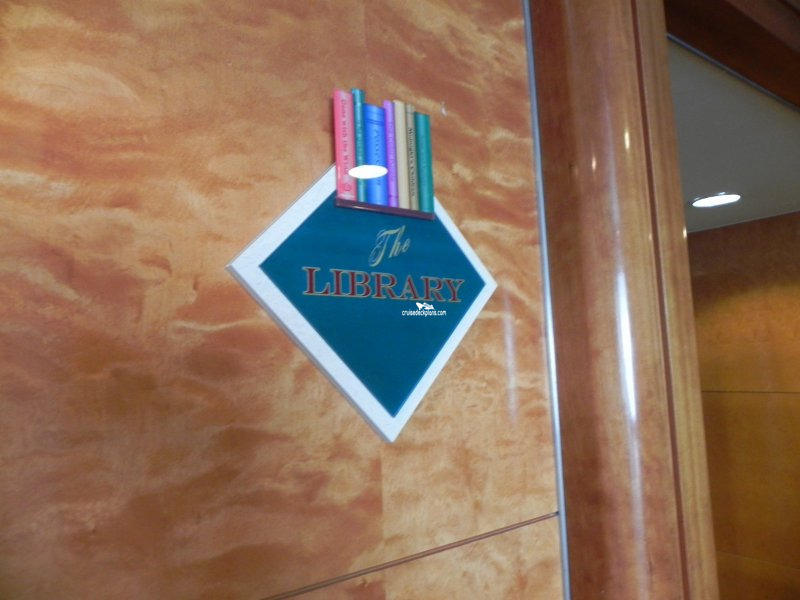 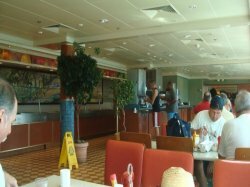 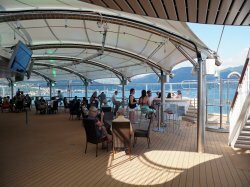 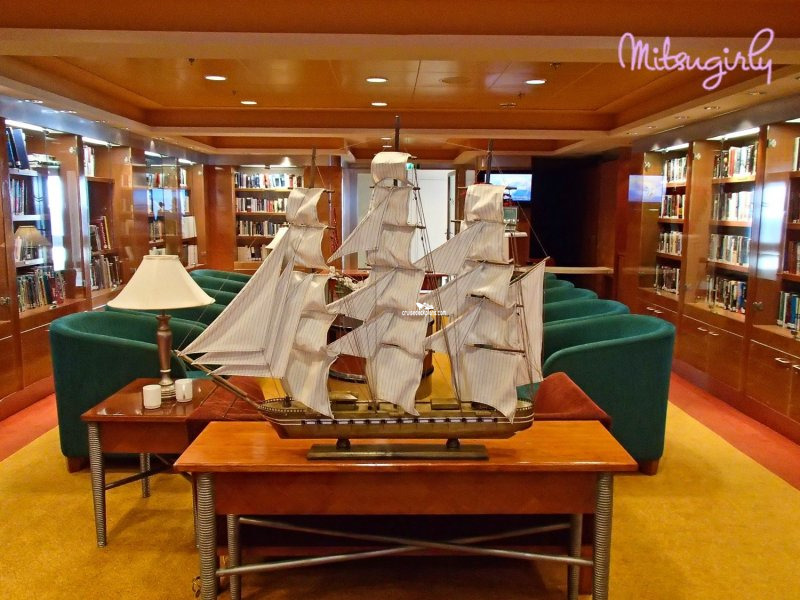 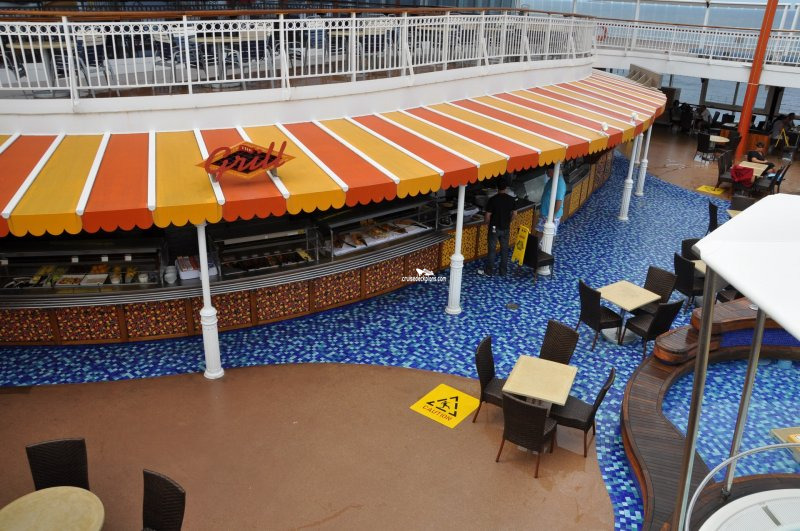 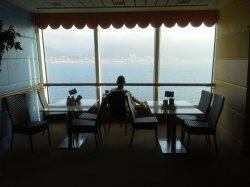 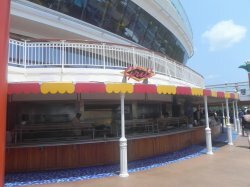 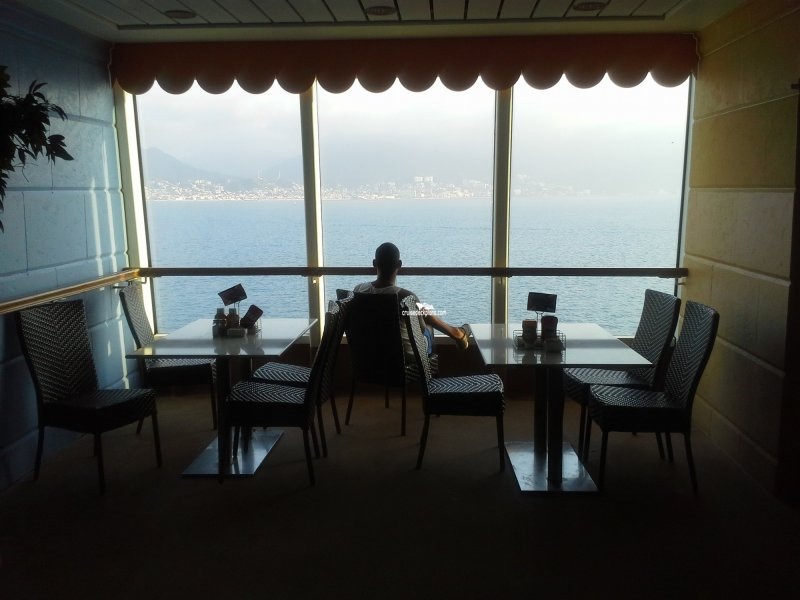 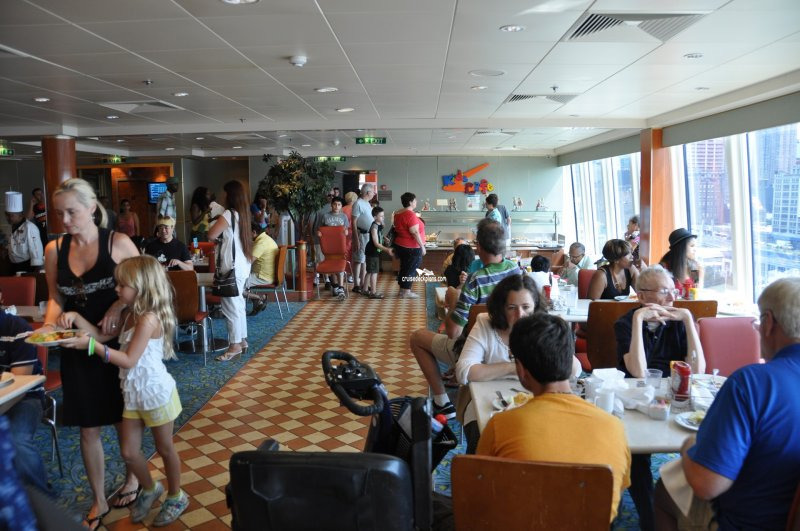 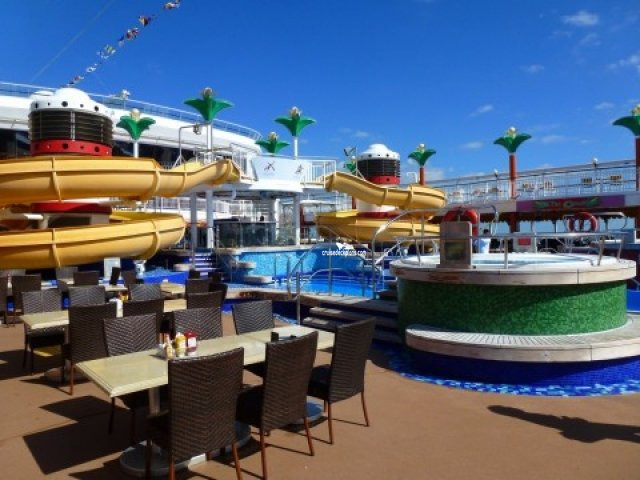 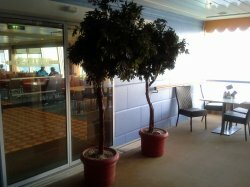 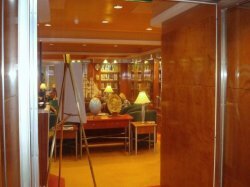 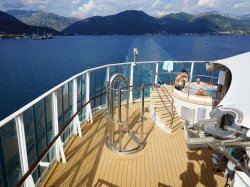 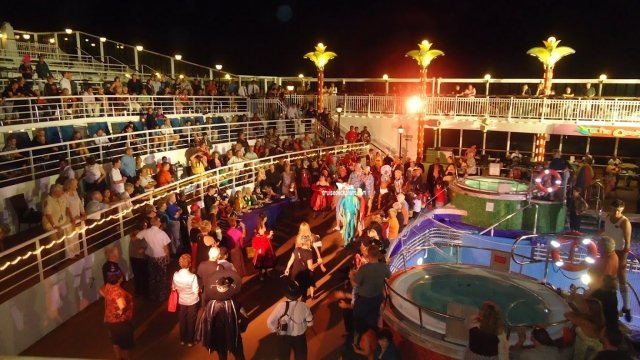 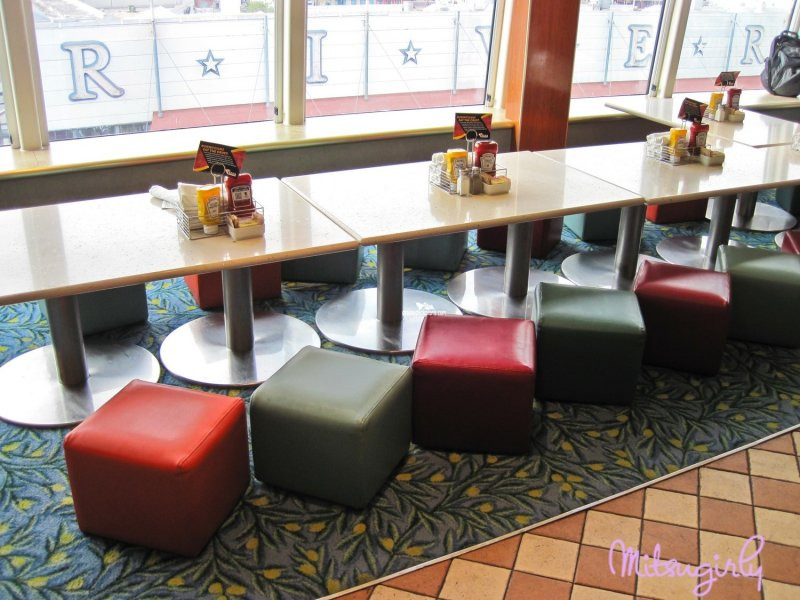 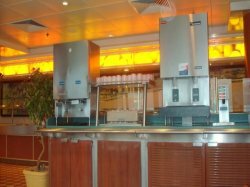 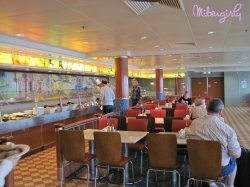 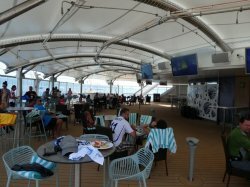 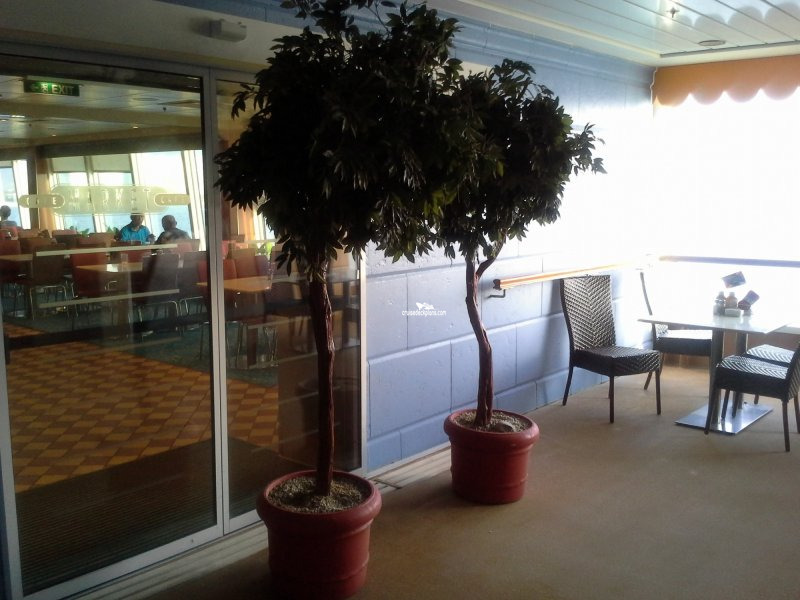 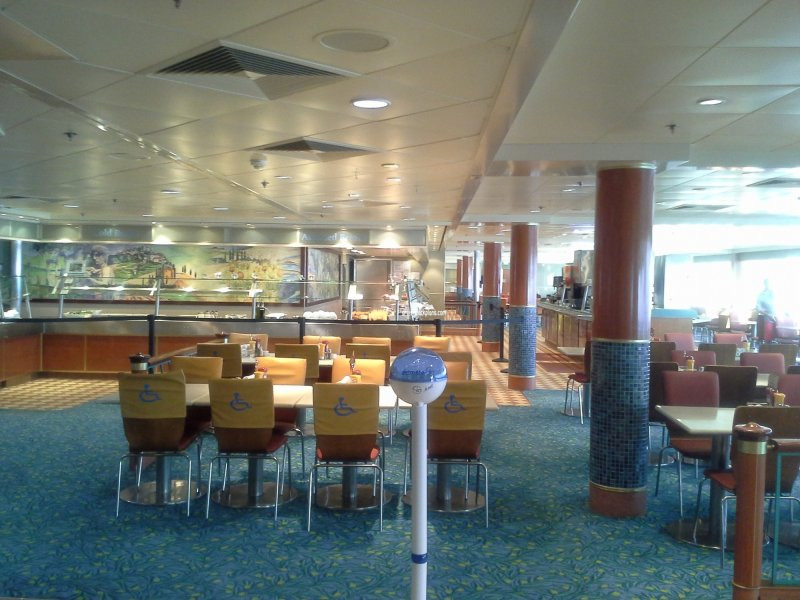 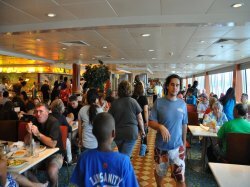 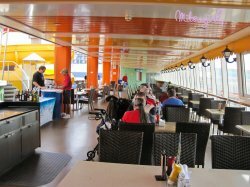 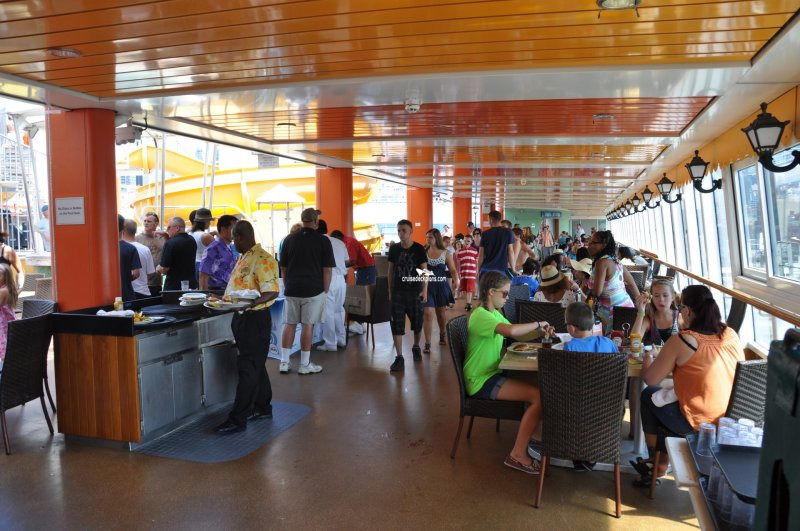 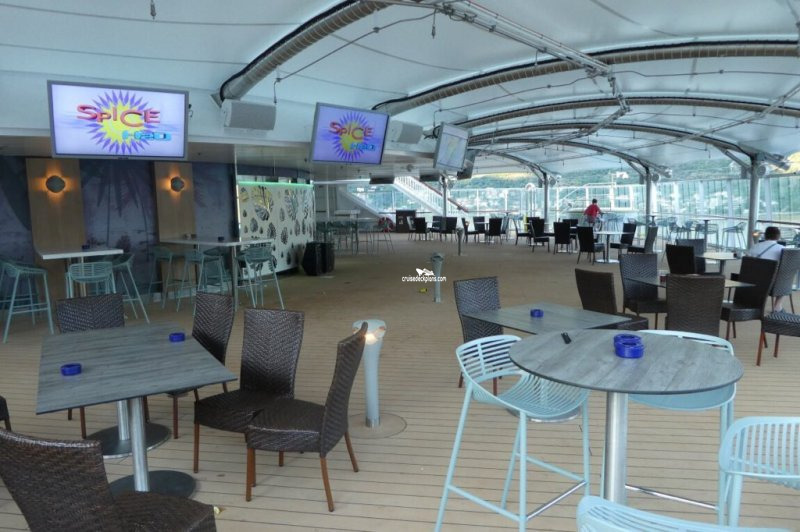 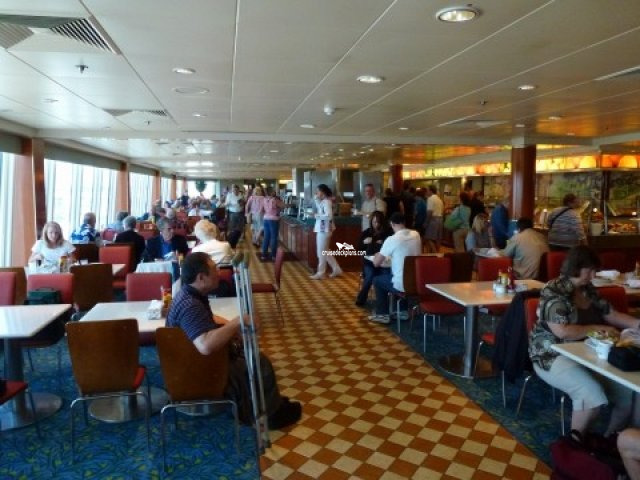 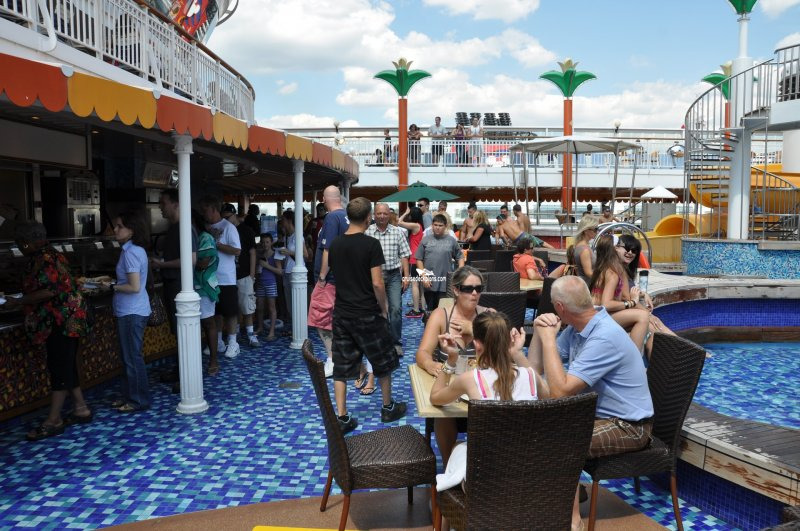 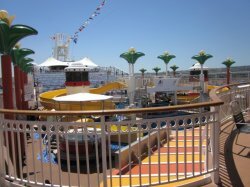 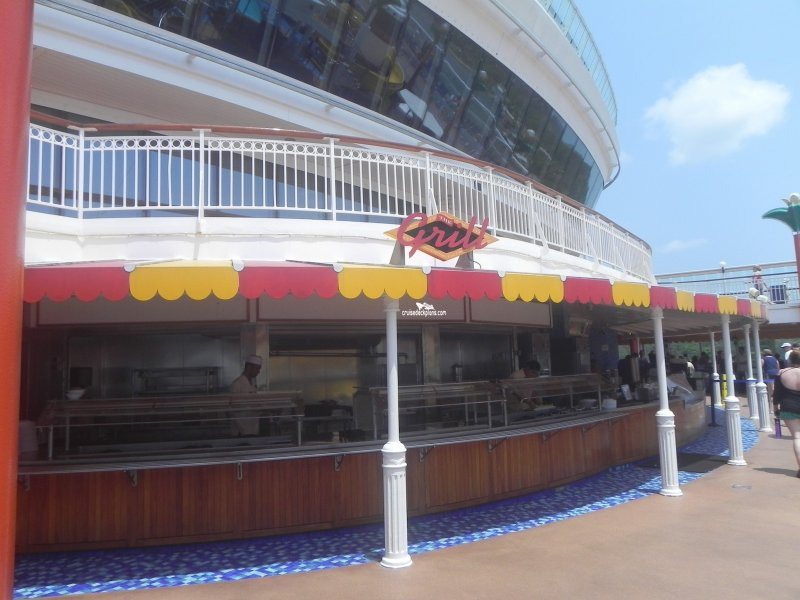 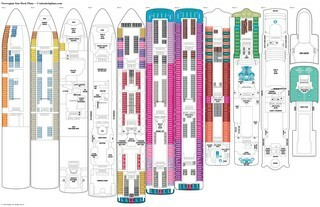 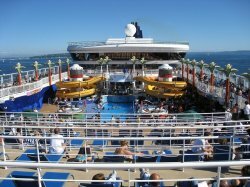 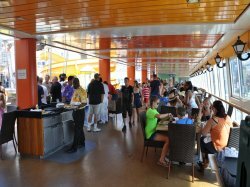 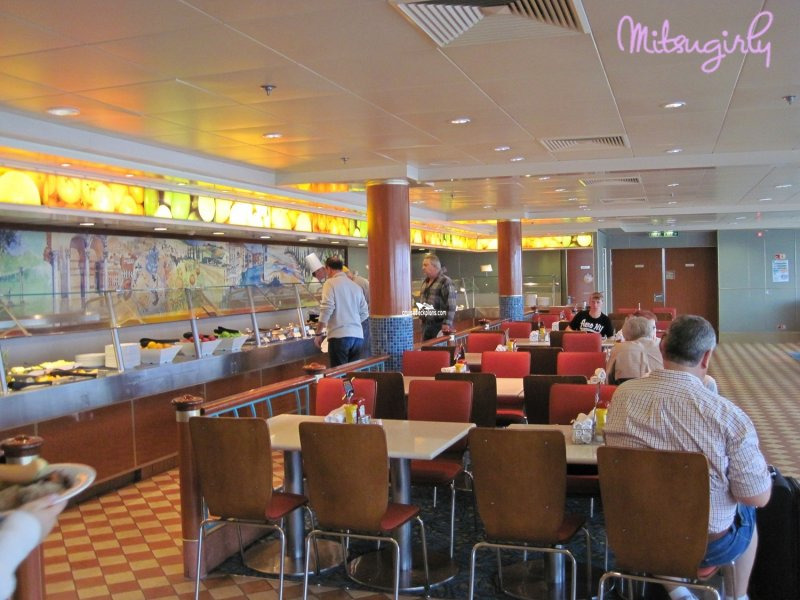 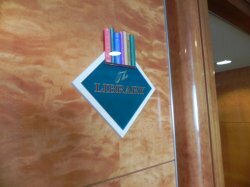 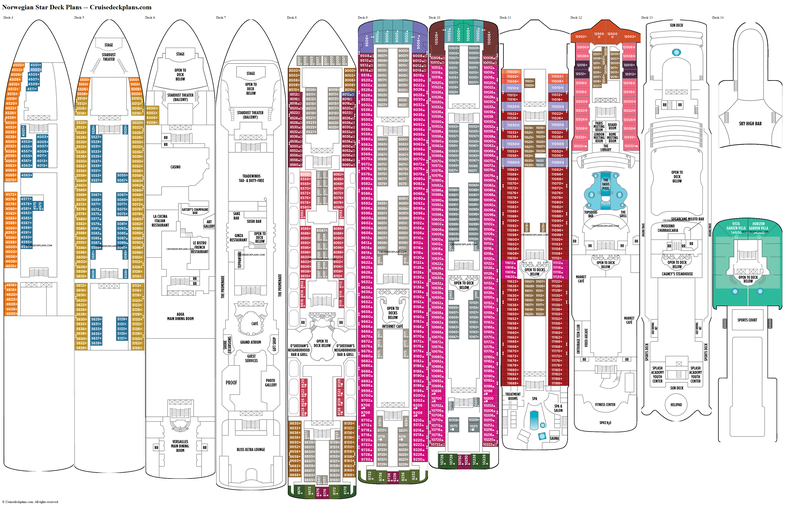 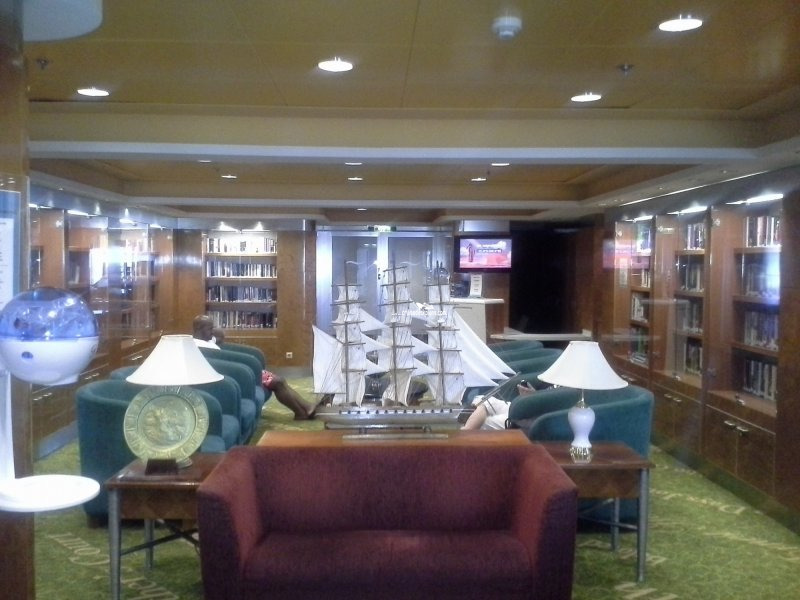 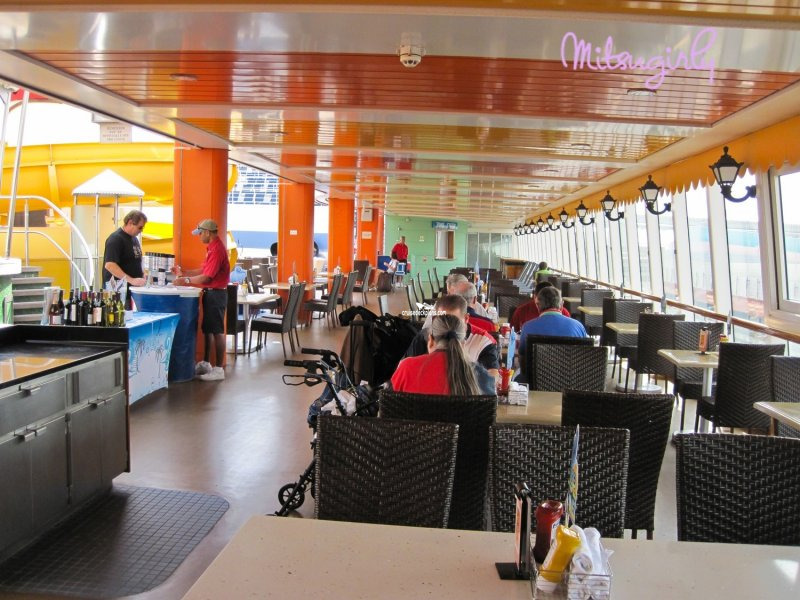 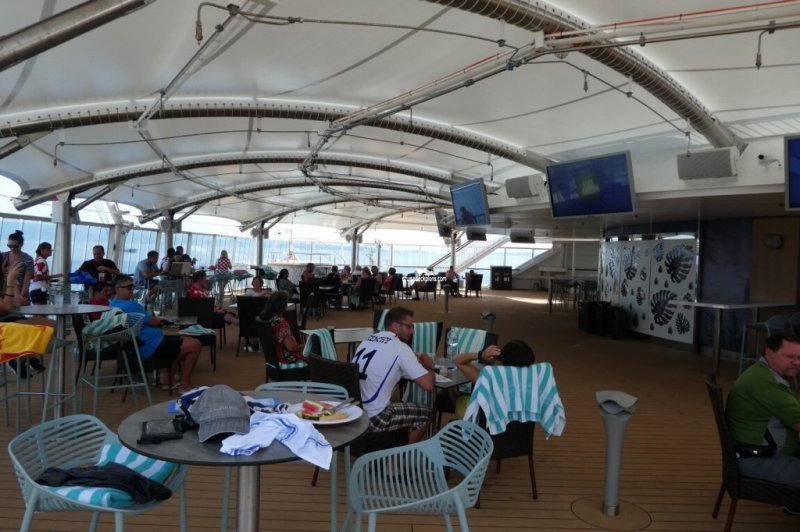 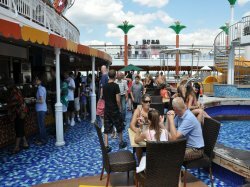 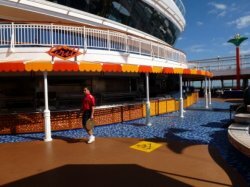 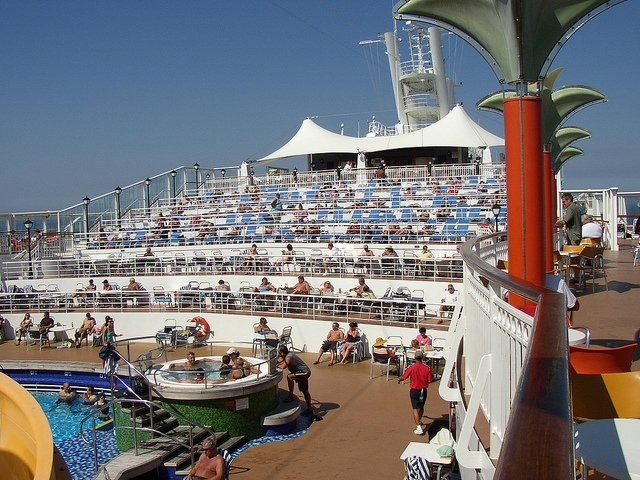 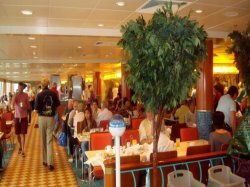 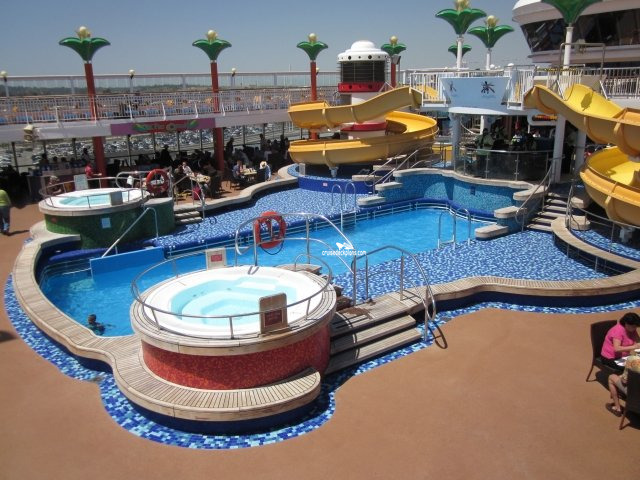 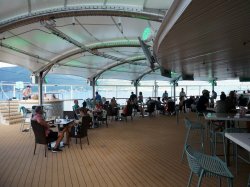 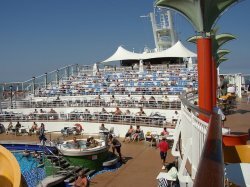 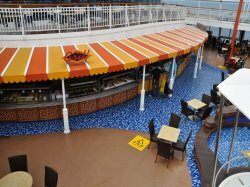 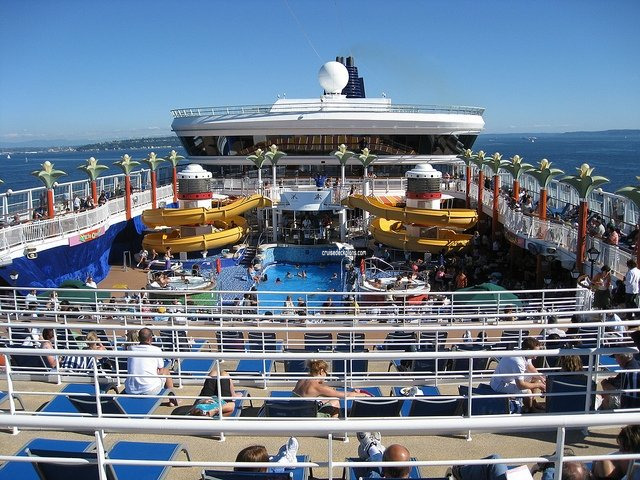 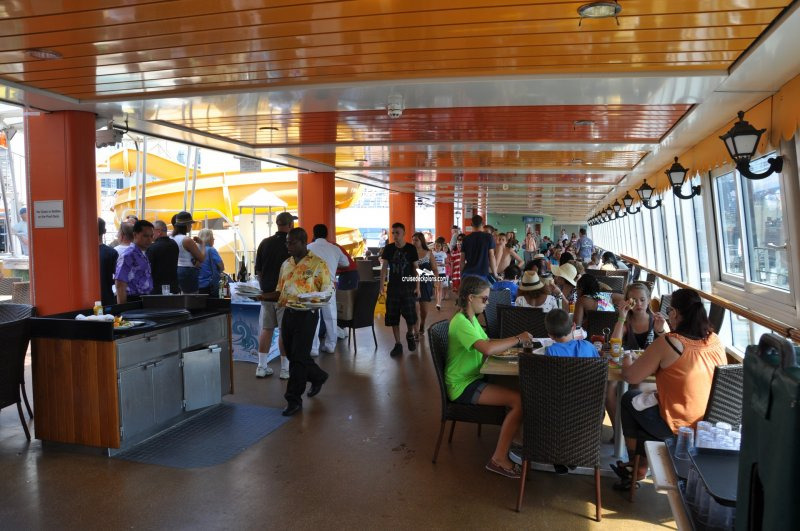 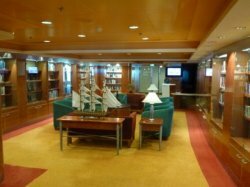 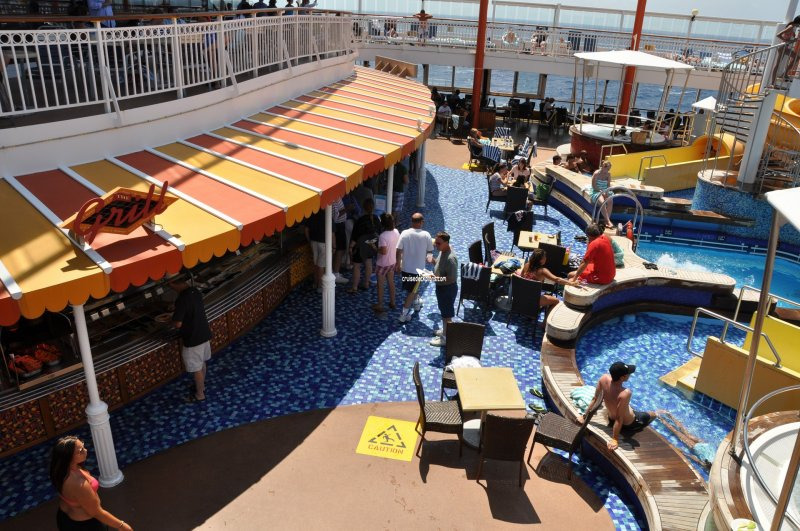 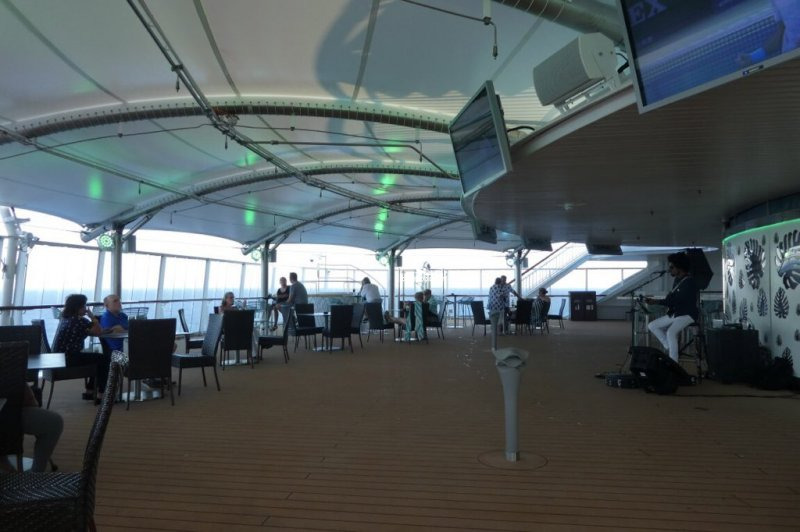 The ship's buffet restaurant offering a family-friendly menu from 7am to 1.30am. 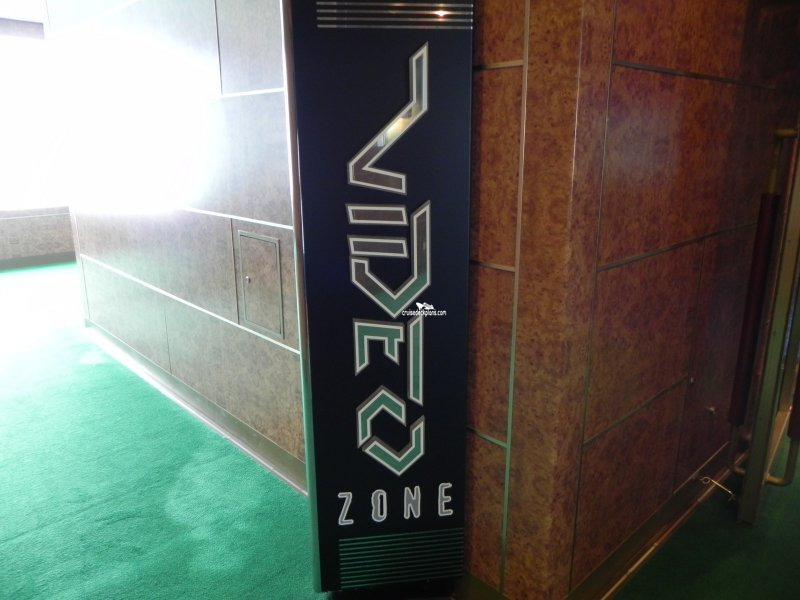 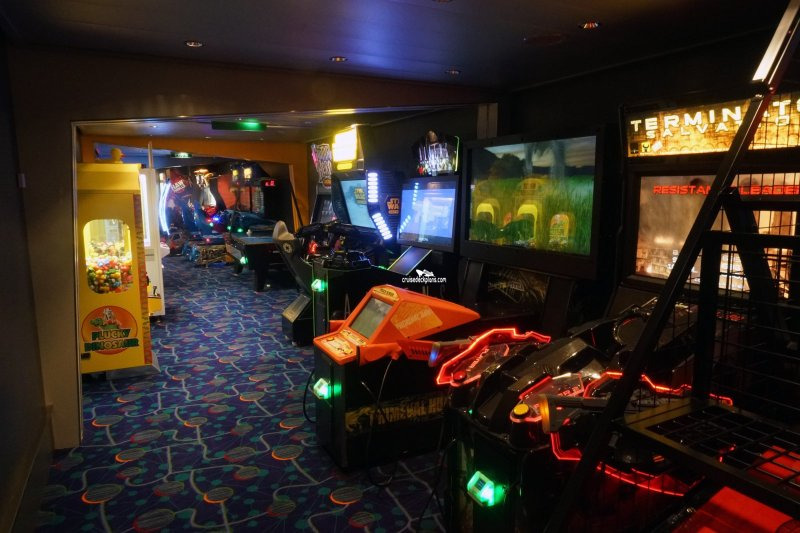 Caters for 13 to 17 year olds and is the ideal place for teens to hang out complete with TV’s, Playstation®3, video jukeboxes, table football and air hockey and at night it transforms into a teen disco. 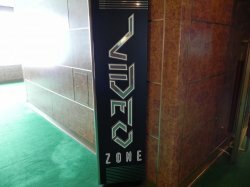 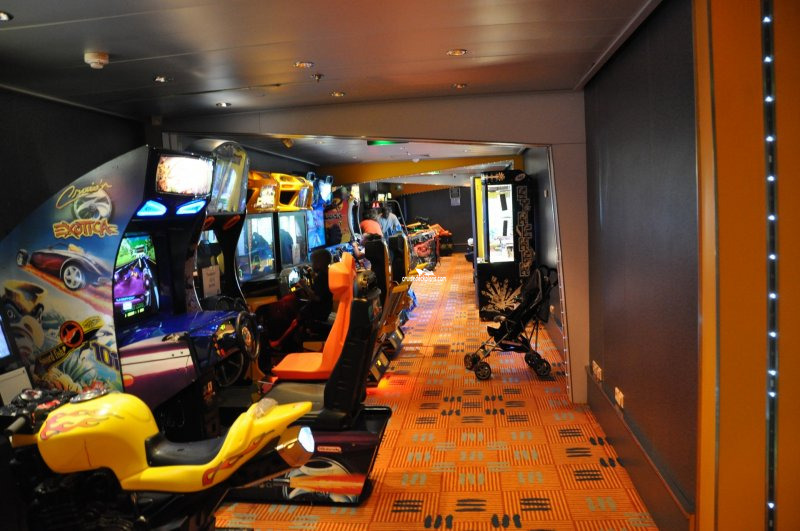 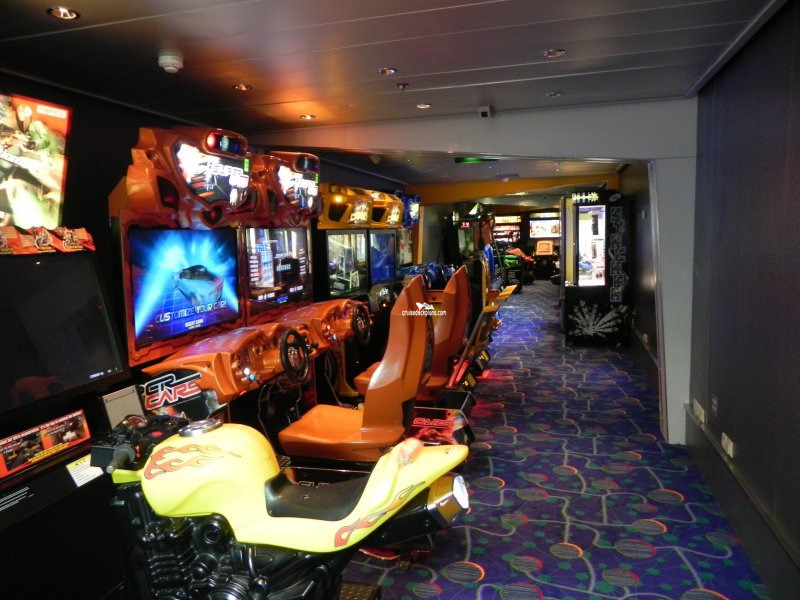 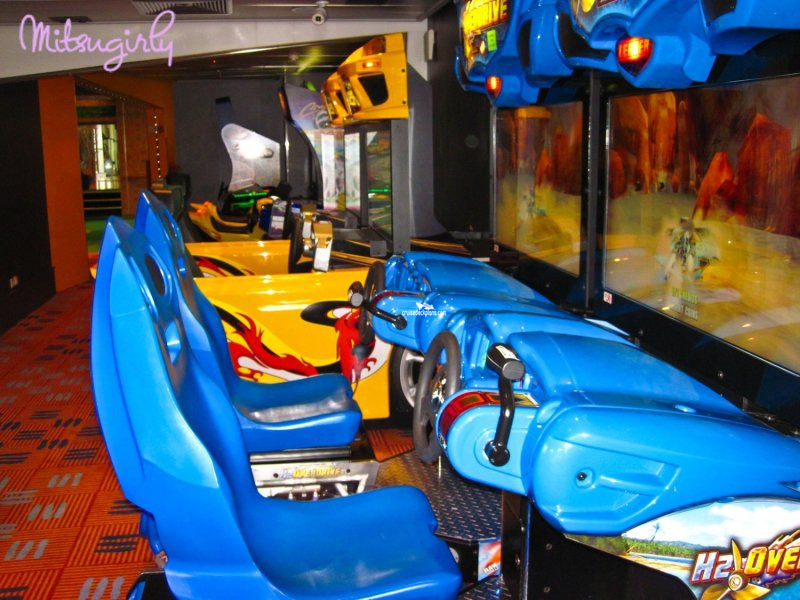 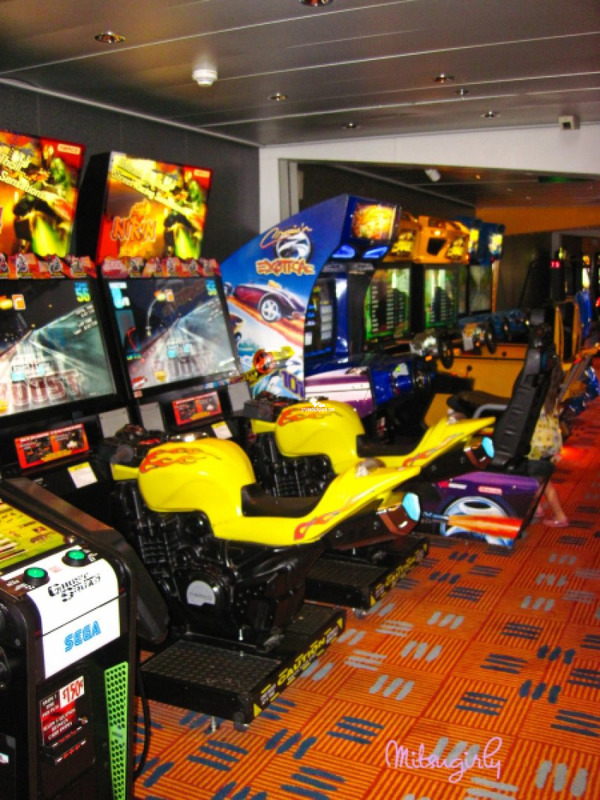 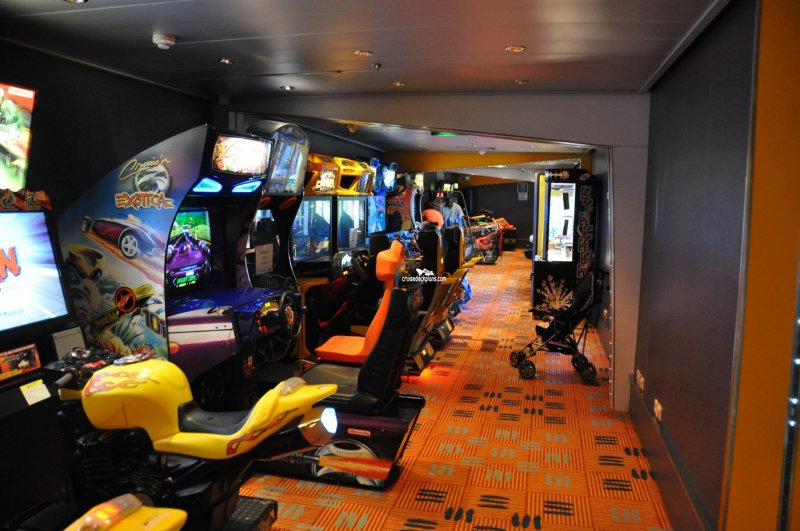 Where kids (and adults) can play car and motorbike simulator racing arcade games, shooting games, Guitar Hero or try their luck on a grab machine. 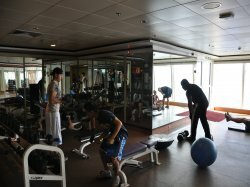 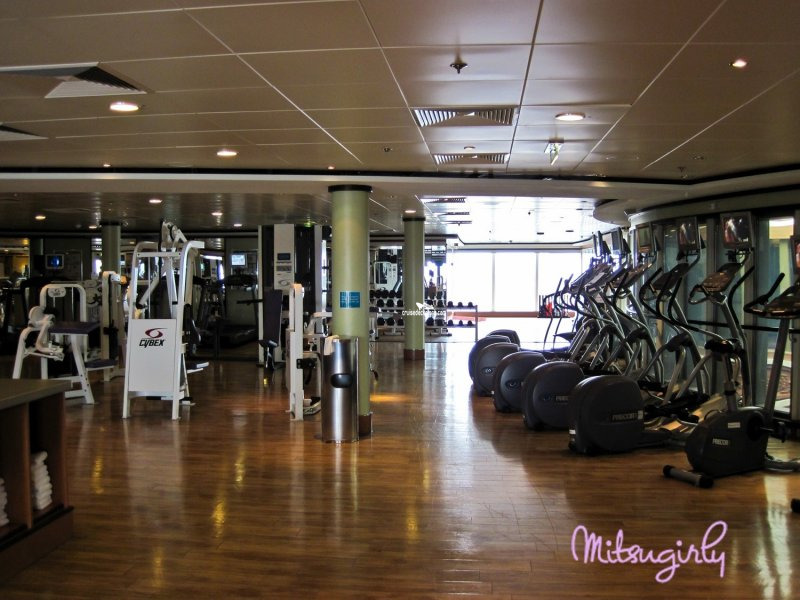 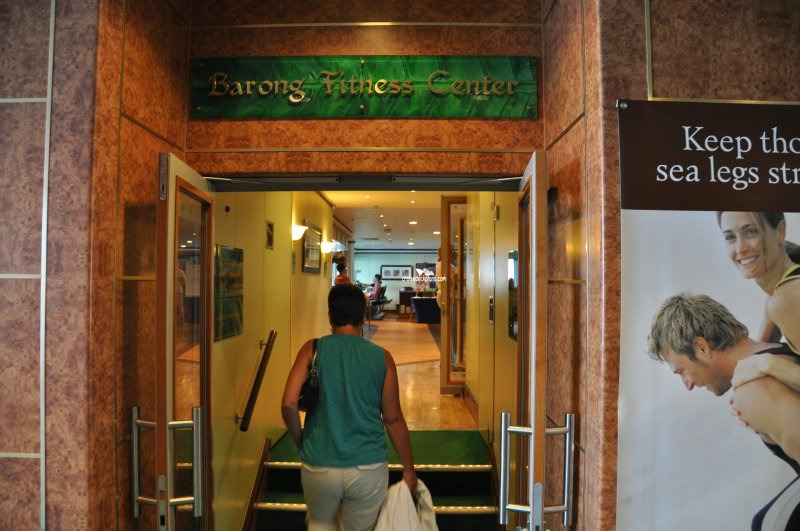 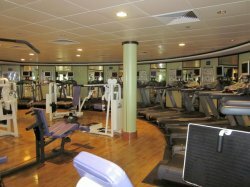 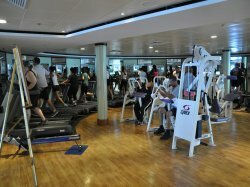 Opens from 8am to 11pm with a full service gym and fitness classes offered daily. 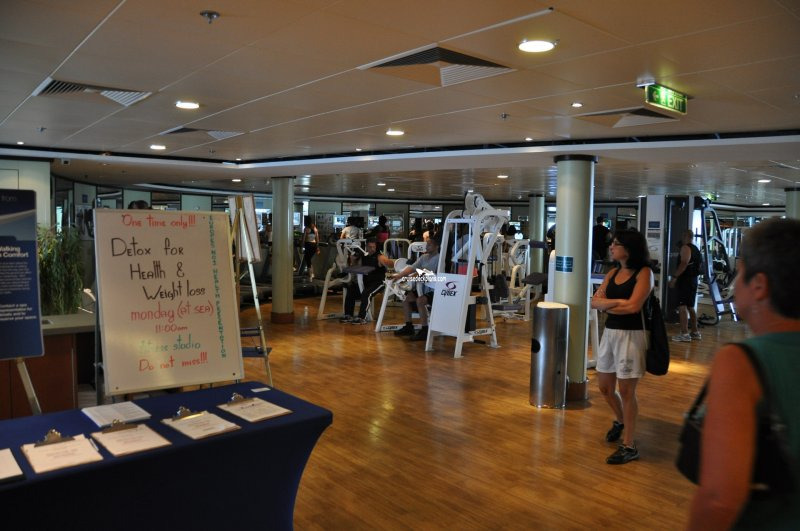 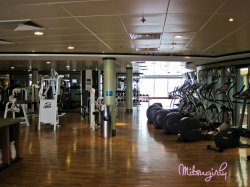 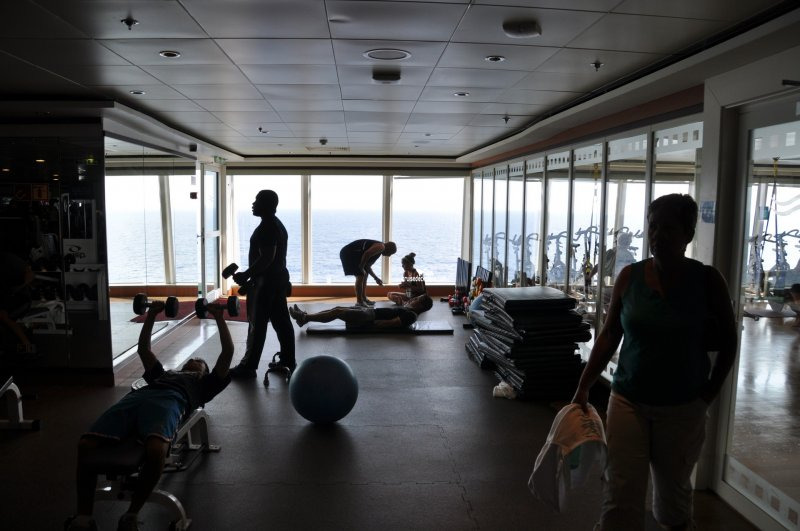 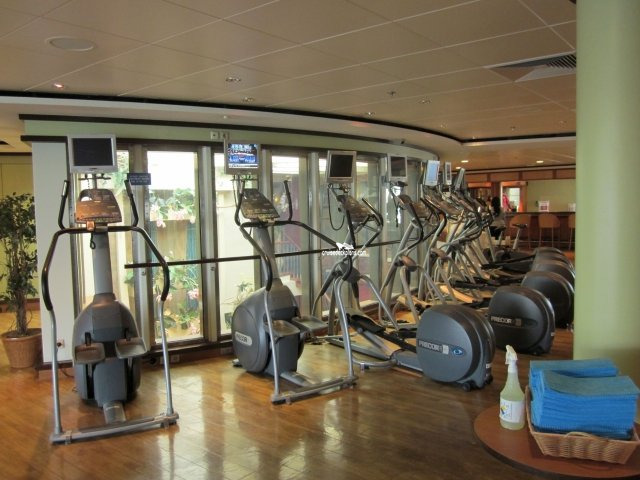 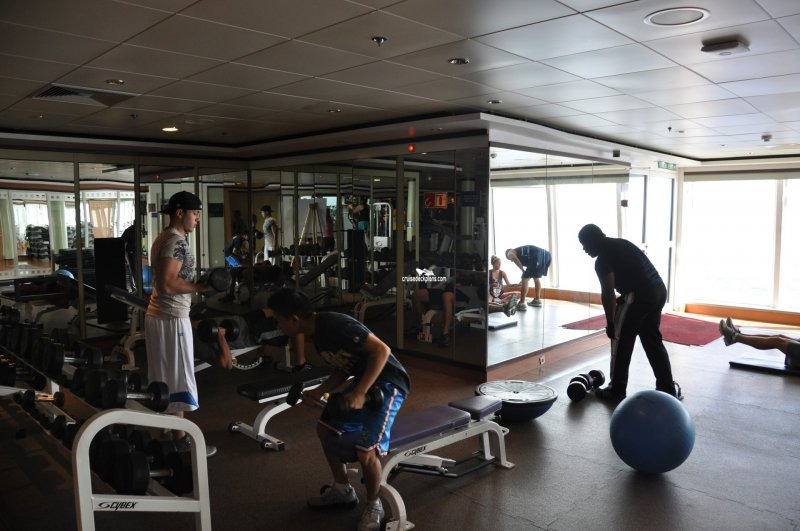 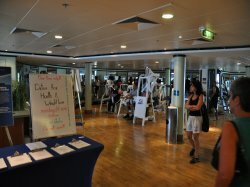 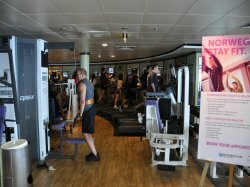 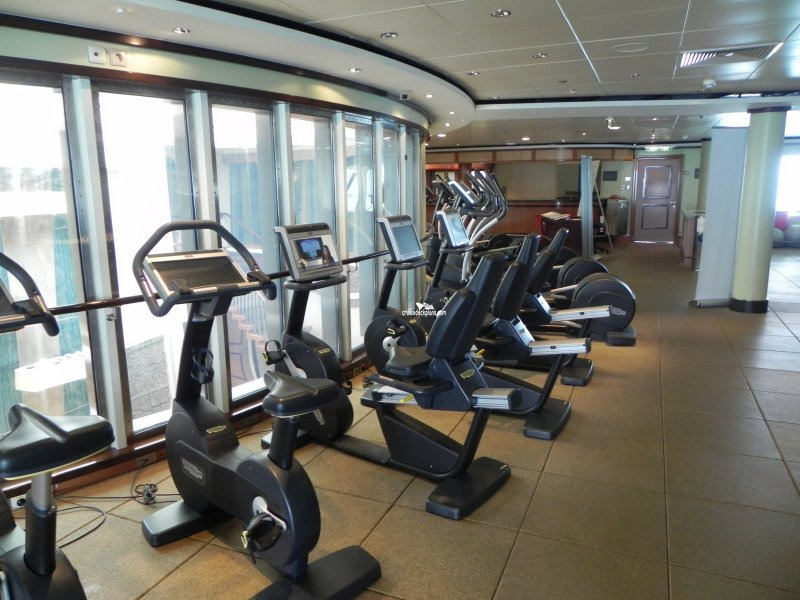 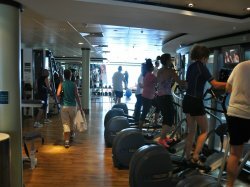 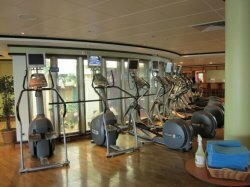 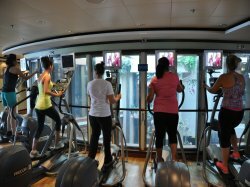 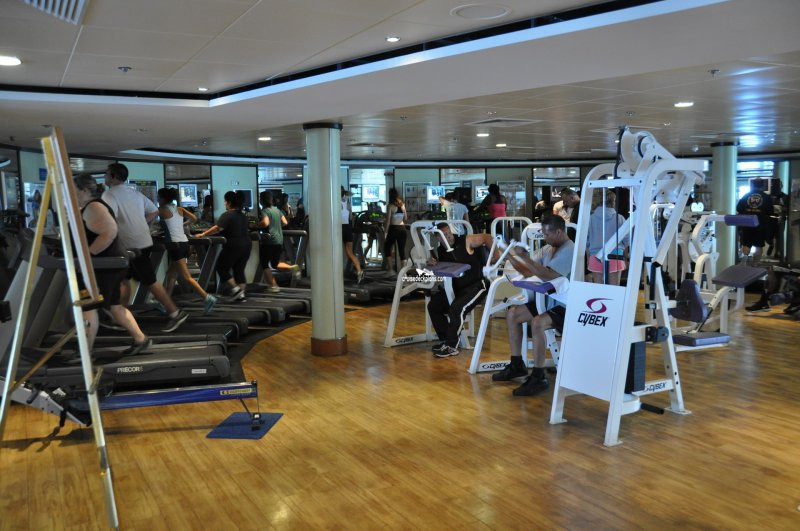 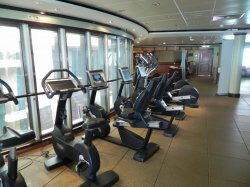 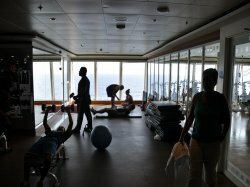 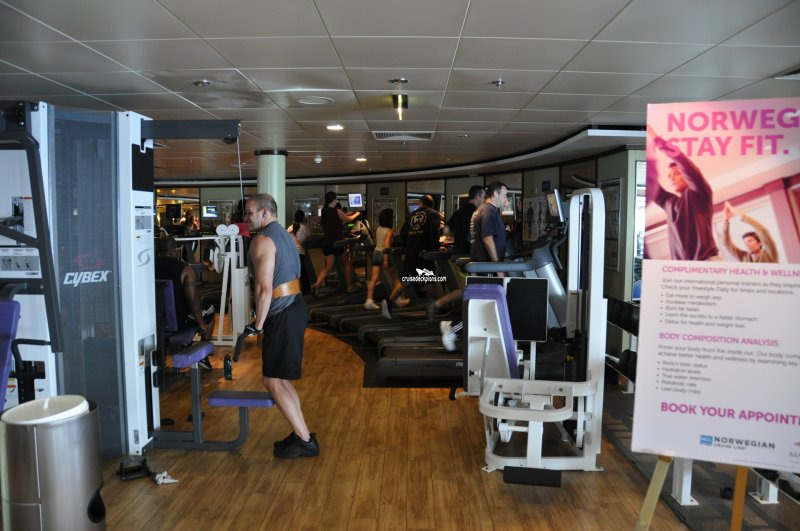 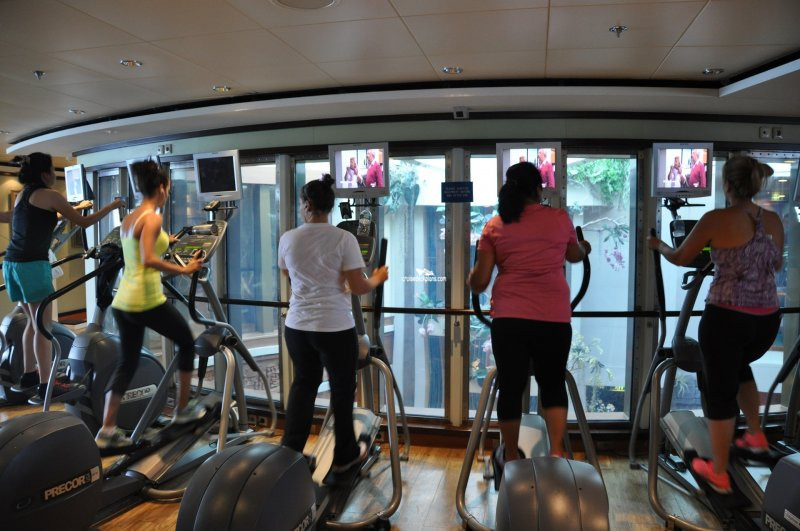 Fitness equipment includes cardiovascular workout machines, weight machines, recumbent bicycles, elliptical machines, treadmills and free weights with the addition of TV screens on individual bikes and treadmills for guests to view during workouts. 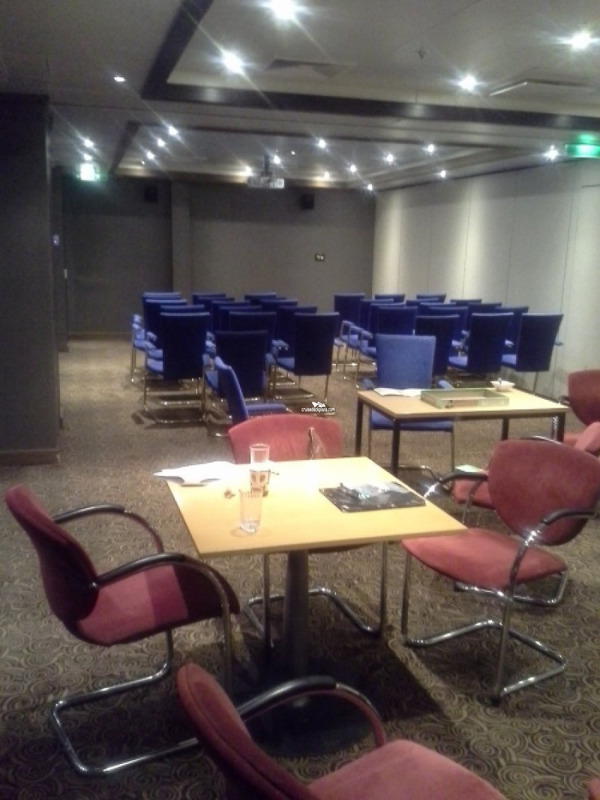 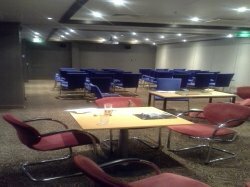 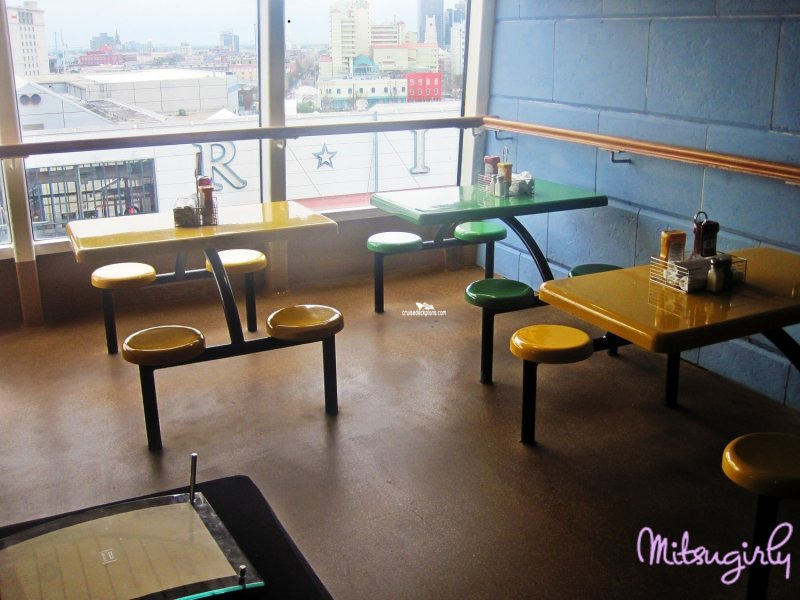 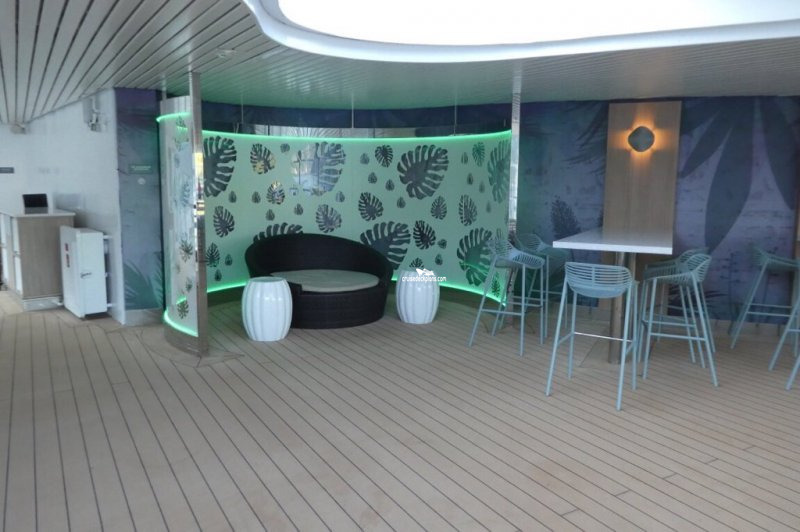 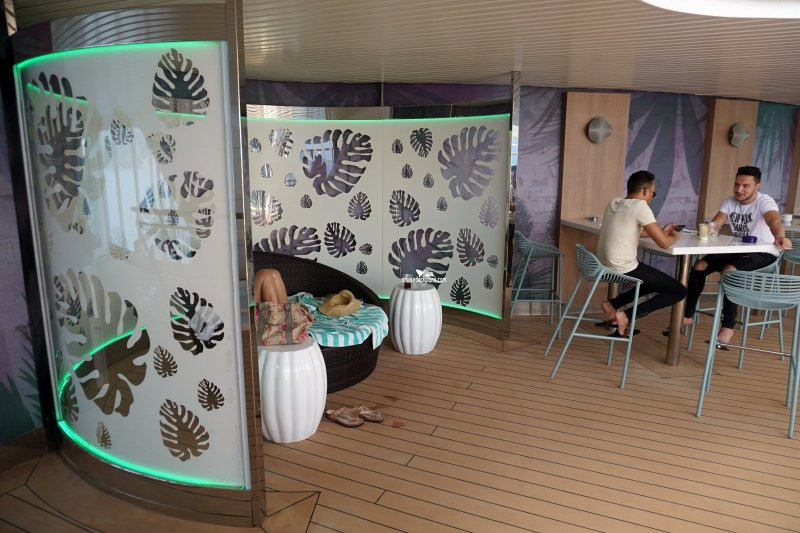 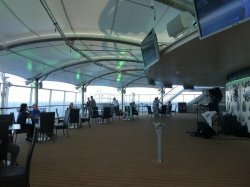 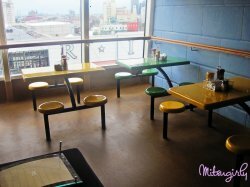 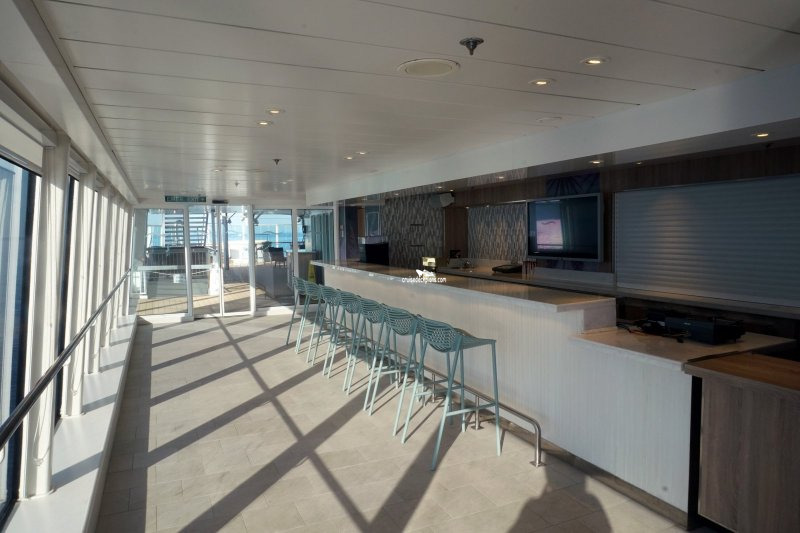 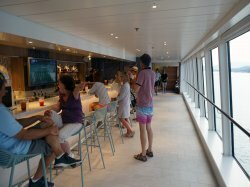 Adult only area with seating and large TV screens. 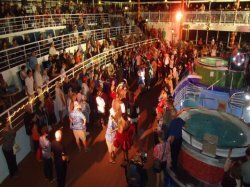 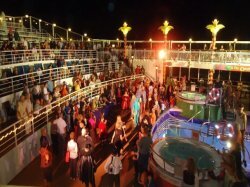 Music and dancing activities at night. 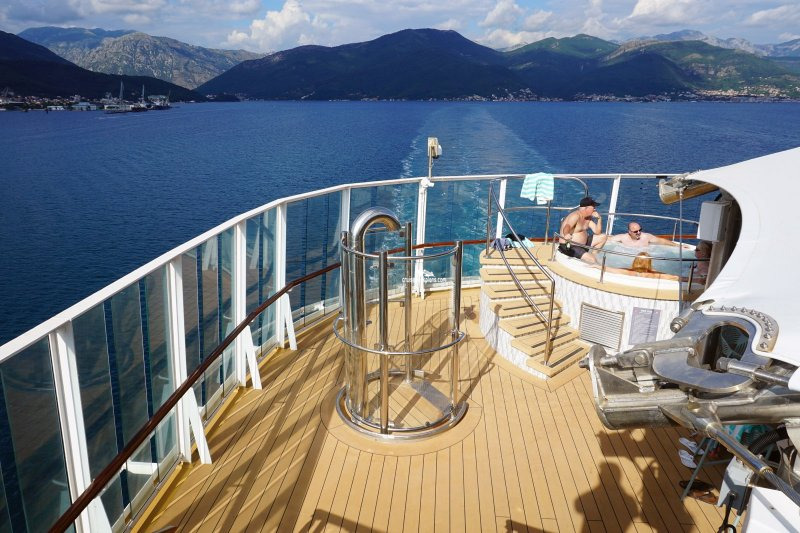 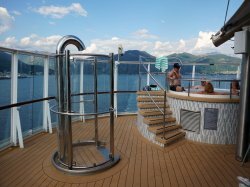 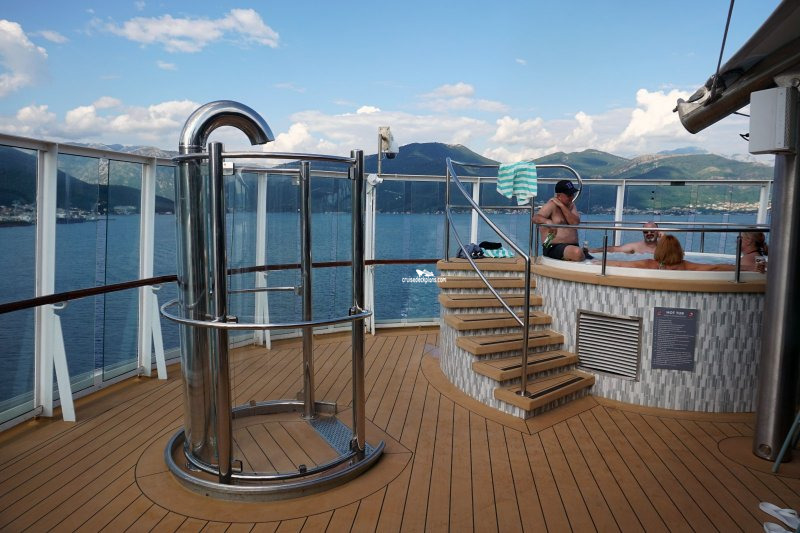 Also has two hot tubs. 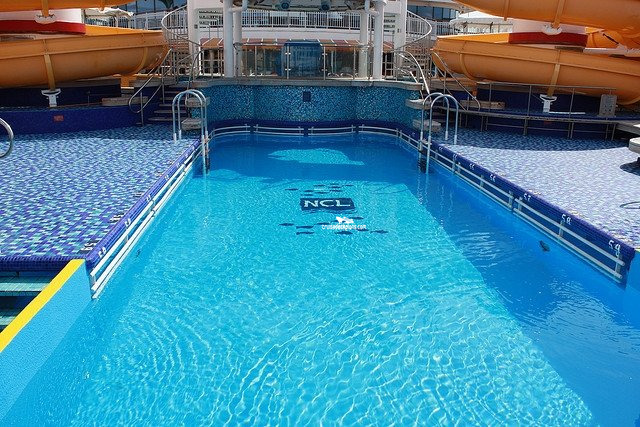 Two swimming pools, one large and one much smaller). 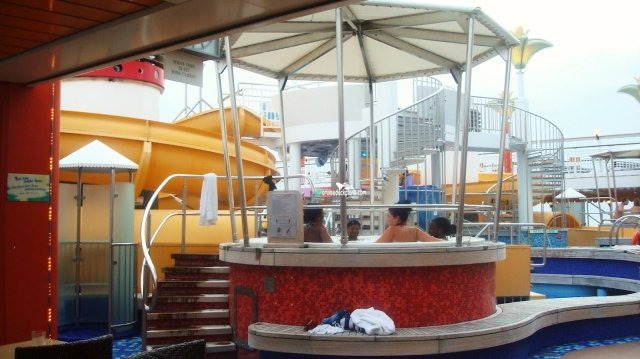 Four hot tubs, theater style lounge chair seating, bar and grill. 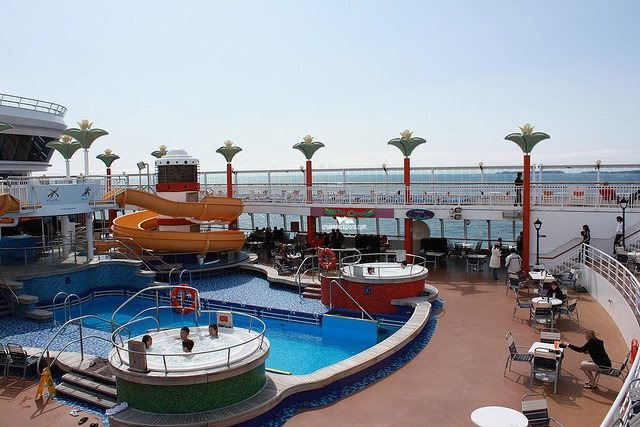 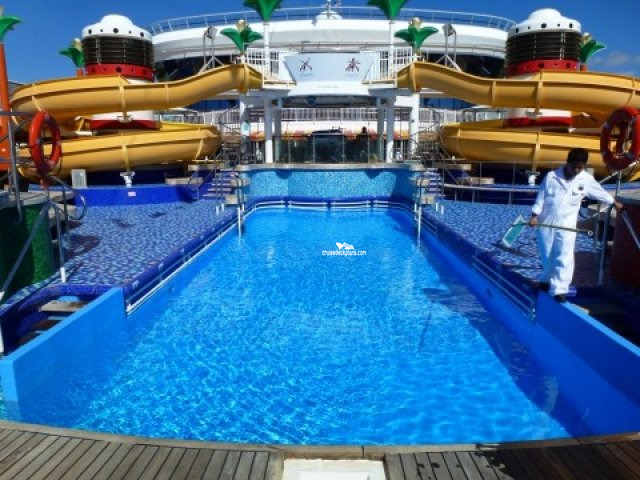 NOTE: THE WATERSLIDES WERE REMOVED IN MARCH 2018. 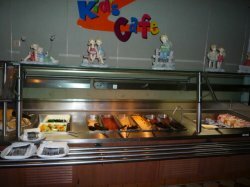 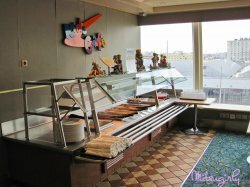 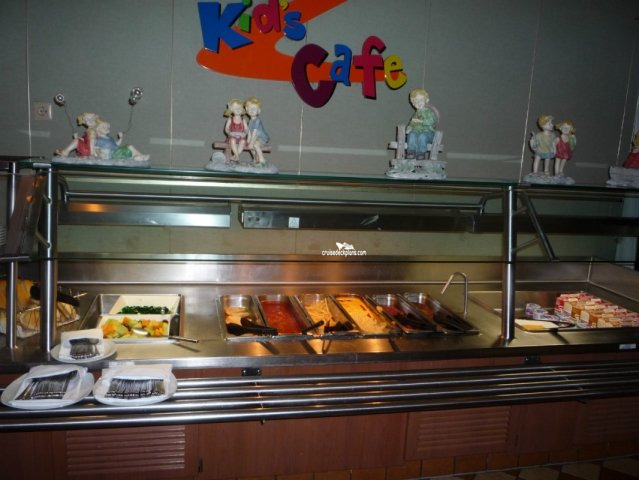 Section of buffet designed for kids. 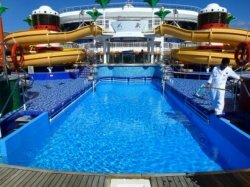 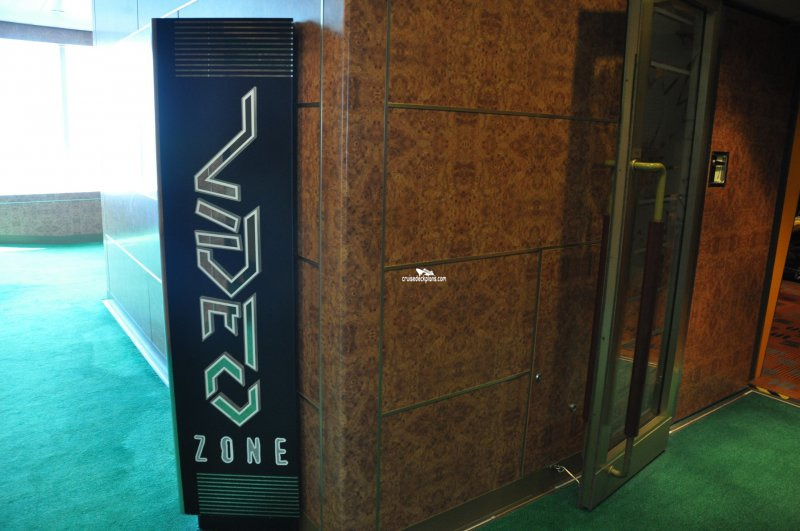 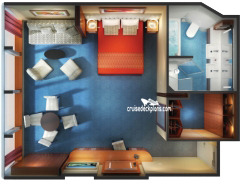 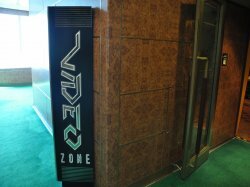 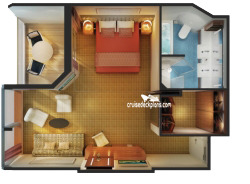 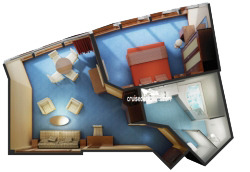 * During day time hours the elevator, stairs and doors leading to pool area will have traffic.